Even though it was a grey day yesterday, my spirits lifted on the huge terrace of Millesgården. Millesgården is the only real sight on Lidingö, the part of Stockholm that I live in, except of course tons of trees, miles of shoreline and a massive amount of fresh air. Carl Milles was an artist, a sculptor. He donated his home which also was his atelier for the purpose of becoming a museum, a memorial. And it really is. On the terrace overlooking a not so pretty commercial port there are many of his sculptures and statues. Like the one in the photo – ”The Hand of God”. 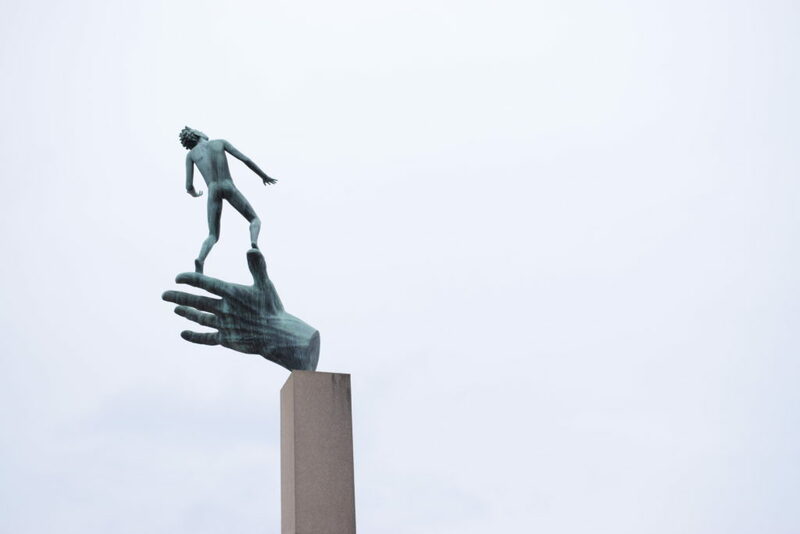 Carl Milles wasn’t a subtle guy, he liked his art works monumental and symbolically easy to understanda. Nowadays, the sculpture garden, the atelier and the home have been made complete as a tourist magnet with a newlybuilt exhibition hall, a really good café and of course, a gift shop. Which is good. As well. Nothing flimsy or sloppy about Millesgården. Quality everywhere.